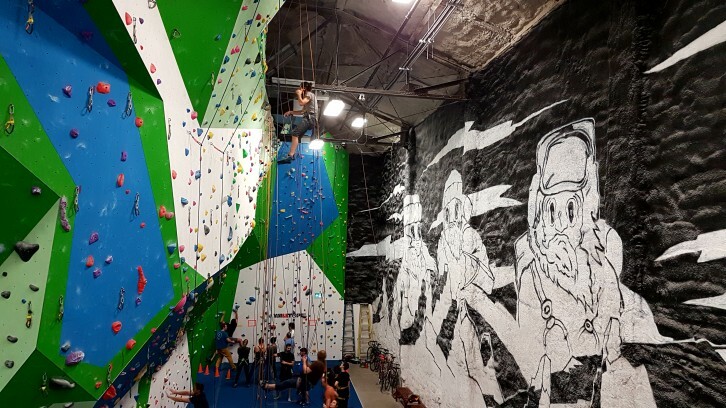 So you want to try indoor rock climbing – awesome! Not only is it a great, full body workout, joining an indoor climbing gym will open your eyes to a friendly and inclusive community of people from all walks of life and experience levels. And rest assured, you can do it! Doesn’t matter your fitness or strength level, indoor rock climbing should be experienced by everyone. It is guaranteed to be a fun time! Our newbie lesson at Basecamp Climbing took over an hour. Very thorough and necessary! A gym that will take the time to teach you everything about rock climbing or knots or harnesses. Learned a lot about that, securing yourself, trusting in your equipment and your partner. Not many gyms take walk in appointment for first timers, so book in advance to ensure you have a fun time. Taking a lesson is also key as it offers info on the safety aspects, technique and the culture around climbing. We found Basecamp Climbing gym on Bloor St. West truly rad! It was inspiring being around friendly and dedicated athletes of all levels. As a newbies, we were very comfortable going through the training course and then climbing. Climbing is a full body workout. Focus on weighting your legs as much as your hands. Breathing is also very important, so don’t hold your breath! Fear of heights is a real deal when you’re climbing for the first time. You may think you’re ok with heights but just be prepared. Climbing is truly a team sport so bring a friend who will be your belayer and visa versa. If you’d like to put your stuff away, a lock for a locker will be handy. However, everyone seems to just leave their things in the main gym area. The walls/climbing paths are color-coded which is straightforward yet when you’re doing it for the first time, doesn’t quite work out that way. Take your time to position your foot and which grip to use next to get up your section of the wall. Be aware of your surroundings. Always look up to make sure no one is climbing above you, if you are starting to climb make sure you are aren’t jumping in ahead of someone else who has been waiting for the same climb. Shopping for climbing shoes will take some time as you’ll need to try a few different styles and find one that fits you best and that you’re most comfortable in. There’s no way to find a ‘good fit’ until you actually try the shoes and Emma suggest finding one that offers a balance between “I could wear these as house slippers” and “are you sure these won’t break my toes?”. You want the shoes to be snug enough that your toes touch the end without any extra space (a little curl in your toes is good) and no extra space around your heal either. When at the gym, bring a pair of flip flops that you can take a break in between climbs. Once you’re ready to invest in a harness, you’ll be surprised how padded they are in comparison to the rental ones at the gym and they come in XS-XL sizes. Harnesses also come for men and women. The reason behind this is because our bodies are different shapes. This doesn’t mean that you have to buy a harness that’s gender specific or matches your own gender. It has to fit your body properly such that it keeps you safe. A good first harness will run you between $55 and $85. It’s recommended to replace a harness no less than once every seven years yet if you’re a frequent climber, like Emma at MEC, it’s not unusual to replace a harness every three years. Be sure to inspect it frequently! For additional info on harness service life, read this blog post. If you have questions about anything climbing related, we suggest to visit your local MEC store. 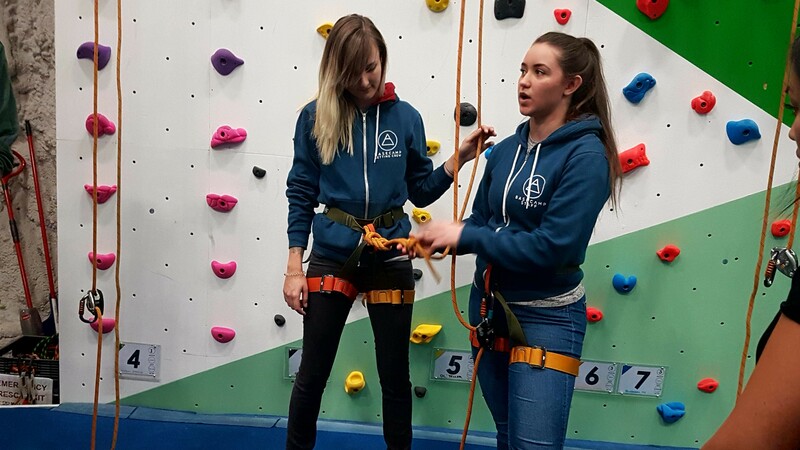 Anyone working in the climbing area is a real live climber and will assist you in the best way! Note: our lesson was provided by MEC Toronto.